You have managed to find an excellent price on your flight booking with us and now it is time to find a place to stay. 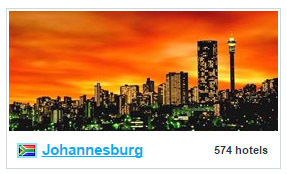 We have South Africa’s largest selection of Hotels for domestic and international travellers. The best part about it is that we search all the available hotels on your behalf with our leading search engine. We also offer budget busting specials on our booking page so keep your eyes peeled as these are usually broadcast for a very limited period. Whether you are looking for a quick stop B&B or a luxurious getaway in a 5 star palace, we have them all at your fingertips. The most difficult part is your input into our search form. It works exactly like our flight booking facility whereby we TAP into every single hotel database around the world to bring you the best deals instantly. 5 million hotel deals, 1000’s of travel sites. 100% free, no booking fees. We’ll ﬁnd you the best deal possible for your hotel. Over 307 million travellers trusted us to ﬁnd the best deal on their hotels in 2013. 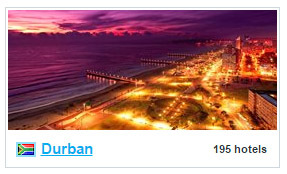 You can be searching for hotels in South Africa, Thailand, Barbados, London and every other destination you can think of. Perhaps you are looking for a romantic honeymoon destination such as Mauritius? You need go nowhere else because we have all conceivable destinations covered right here for you. 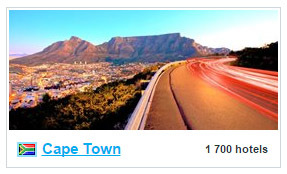 Don’t forget that we have cheap flights to Cape Town, Johannesburg as well as all other domestic and international destinations available all year round which we bring to you daily as well as our Facebook page and newsletter where we bring you the latest news and views of the travel industry along with competitions.